I should have called this dish: compromise peas; finding the middle ground peas. A warm spring day, about seven years ago, back when I was a new bride with smoother hair, smaller waist and nonexistent squeaky toys in my living room, Mohamed and I came home from the farmer's market with a bag full of fresh green peas for dinner. He made mint tea for both of us and we took the bowl of green peas to our then tiny, but beloved, balcony and started shelling. We shelled, he ate and I talked. It was the perfect harmony, the perfect start to a beautiful dinner and evening; until I went to the kitchen and cooked peas the way I always had them at my parent's house, which is in a hearty stew with meatballs and a touch of cream. It was delicious, comforting; at least to me. He set the table, must have lit some candles (we don't have candles on the table anymore, as all our daughters want to do when they see them is either touch them, blow on them or sing happy birthday) put on some music, must have made his way to the living room table dancing (thank goodness he still dance. I love his moves and so do the girls) and sat down to see in front of him a pool of green-brownish peas with scattered meatballs swimming. "Don't be silly, it's green peas!" "You mean The green peas we spent the afternoon shelling?" "Yep…doesn't it look scrumptious! go ahead, help yourself! Bon appetit!" "Is this how you usually make it ?" He replied. "Yes, why?" I asked as my eyes started to get blurry. Being the polite, but still picky, man he is, he served himself and ate a few spoonfuls before stopping short, thanked me for the lunch but this wasn't really his preferred peas dish, though one of his favorite vegetables. Of course I must have cried (one day I cried when I saw the butter oozing out when making puff pastry) and he must have consoled me while making funny faces and we both ended up laughing at all what was left of the dish that I had to eat by myself. We had another cup of mint tea on the balcony and started talking about green peas and the traditional way they are prepared in Algeria. Green peas are usually cooked with lamb, in a turmeric, saffron, herbs and ginger scented sauce. Near the end of cooking, eggs are poached in the sauce and some lemon juice is drizzled on top to brighten up the flavors. Of course the dish is delicious and fresh and lighter. It is in fact as much comforting and familiar as the green peas dish I grew up eating. The sauce is bright, warm from the spices and sweet from the fresh green peas, but frozen green peas can be substituted if not in season. 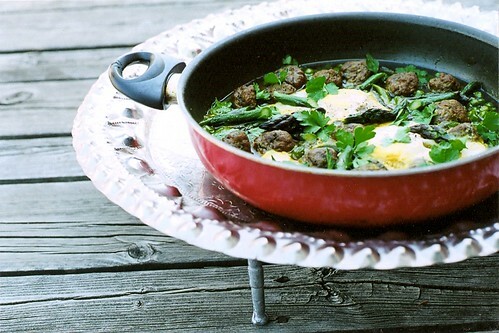 The dish is a cross between my mother's green peas and meatballs and Mohamed's favorite sauce and luscious poached eggs at the end. The addition of asparagus to the recipe is a personal touch, my personal blossom in the kitchen. 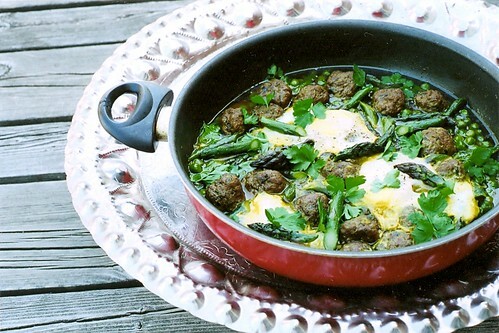 Combine all the ingredients for the kefta together and form into small meatballs. Heat 1 tbsp of oil in a large, fairly deep pan and brown the meatballs on all sides. Remove from pan and set aside. Pour the remaining oil into the same pan and add the chopped onion. Cook until translucent but not browned. Add the spices and 1 ½ cups of water. Season with salt and pepper, and bring to a boil. Gently slide down the meatball and cook, covered, for 15 minutes. Add the peas and asparagus to the sauce and continue cooking for another 10 minutes, uncovered, until the vegetables are tender and the sauce has thickened a bit. Carefully break the eggs into the sauce and poach them until set. Add the lemon juice and chopped parsley, and serve at once with bread to soak up the goodness that is this sauce. This sounds so delicious! I would never in a million years have thought to team the peas with the meatballs. And then the poached egg! Just amazing. - Mima, il n'est jamais trop tard pour changer ;) en tous cas moi je l'aime tjrs ce plat. - Molly, give it a try! it's beyond delicious. I love little meatballs and peas , now I must try your version . The sauce looks delicious ! 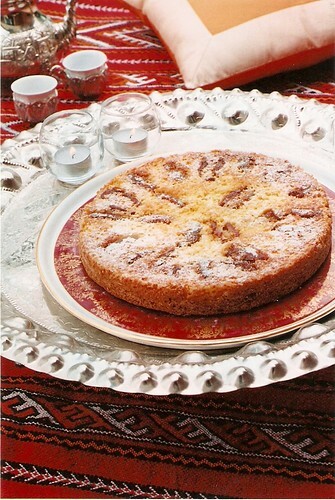 I'm algerian and have not heard of this dish. but I'm really glad I do now; it sounds delicious. I will make this very soon, hopefully wih fresh peas. I LOVE your blog by the way and so many new recipes, and others that remind me of home. What an interesting dish! Very unique and sounds delicious. the other day I made a scallop dish, and tried my hardest to make a white wine sauce, to no avail, so after taking 30 minutes to make a sauce, I scratched it and in 10 minutes made scallops with polenta and parmesan cheese with brown butter sauce. I brought the plate to the table and was like "here, sorry there isn't any sauce." But luckily the dish I produce was delicious and my failure with the sauce didn't bring me to tears. My husband is kind of a picky eater too - nothing too ethnic, which are the foods I love! With no disrespect your recipe, I used some ras el hanout as the spice base in the meatballs and the sauce... absolutely delicious! 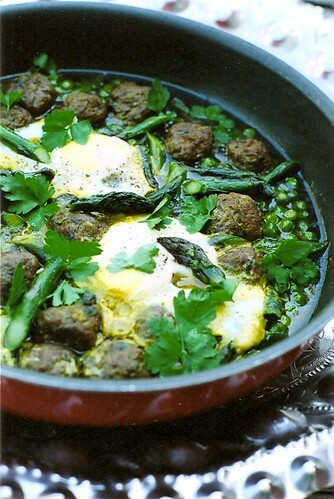 the peas, lamb, asparagus, egg... yummmmm. With Khaled and Rachid Taha playing on my I tunes, I felt like I was in north Africa! I love your blog and recipe inspirations. Shookran & Merci. Oh this is a beautiful story! And a beautiful dish too! Perfection. I can't wait to try it. My husband's family is from Oran, and they also have Boulettes aux Petits Pois! It used to be their standard Friday night dish, but they had to give it up because of my husband- who, since early childhood, couldn't stand peas in any form or style. - Y, it is indeed very popular in Oran, where my family lives, but you can always try it without the peas as a meatball sauce or with another vegetables like fennel, which works beautifully in this dish. THANK YOU THANK YOU THANK YOU FOR POSTING THIS!!! I just came back from a semester in Morocco and missed the tastes and smells so desperately. This hit the spot exactly. Ever since I made it, I've been dreaming about it and wishing we hadn't eaten it all that night. - Samantha, glad to hear that my recipe contributed to bring this part of the world to your own world :) The one you made sure looks delicious! Hey- great idea, about the fennel!